Cockermouth is a thriving market town, located at the confluence of the rivers Cocker and Derwent. Although its origins were in medieval times, its main period of growth was in the Georgian era, in the early eighteenth century. This coincided with the rapid growth of Whitehaven and Maryport, just to the north on the Solway, as ports to exploit the export/import trade with the new English colonies in the Americas. During this time, Main Street, Market Place, Helen Street and Kirkgate were laid out. Quite remarkably, nearly all of the original buildings are still in place. Each house built at this time had an associated plot of land behind it, with a covered archway entrance - just like the entrance to Conkey’s Court, adjoining Kirkbrae Cottage. In the late eighteenth century, as the fortunes of Whitehaven and Maryport waned (due to competition from the west coast ports of Glasgow, Liverpool and Bristol), the merchant houseowners, responding to the opportunities of the industrial revolution, built small cottage-size factory units immediately behind their houses. Thus street access from the covered archways was into a ‘yard’ or ‘court’. During the nineteenth century, and early twentieth century, trade declined and early photographs show a number of these industrial cottages lying derelict. Local historian J.B. Bradbury has documented the history of these yards in a wonderful small book entitled ‘Cockermouth in Pictures: Courts and yards’, a copy of which is in the lounge. Kirkgate was an important residential street in early Cockermouth. The attractive Georgian houses fronting on to the cobbles (which are now ‘listed’ in their own right) were built in the 1720-30 period. The front part of number 53 was probably part of what is now number 51. Conkey’s Court contained four industrial units. The furthest building in the court was a tannery, but the use of the other three buildings is not known. Certainly they were in a dilapidated state until a few decades ago, when the two cottages next to the tannery were renovated and converted into a single house. Probably about the same time, number 53 was combined with the first cottage in Conkey’s Court, to make the rather unusual cottage on 4 levels that you are now in. Kirkbrae Cottage when purchased in 1996 had a lot of the original features hidden from view. We were able to rediscover the two fireplaces which had been boarded and plastered over, and we also had the excitement of finding the original panelling in the front bedroom concealed beneath layers of wallpaper, hardboard and more wallpaper. The upstairs beams had been boxed in. Removal of the horsehair-bonded plaster over the beams in the front bedroom and the bathroom exposed them to daylight once again. Unfortunately, we had to sacrifice the very narrow stair to the right of the lounge, in order to build the present stairway to the dining room. Cockermouth today has almost everything a visitor might want. It is officially classified as one of England’s ‘Gem Towns’ (although I don’t know what that means, nor which are the other 49). 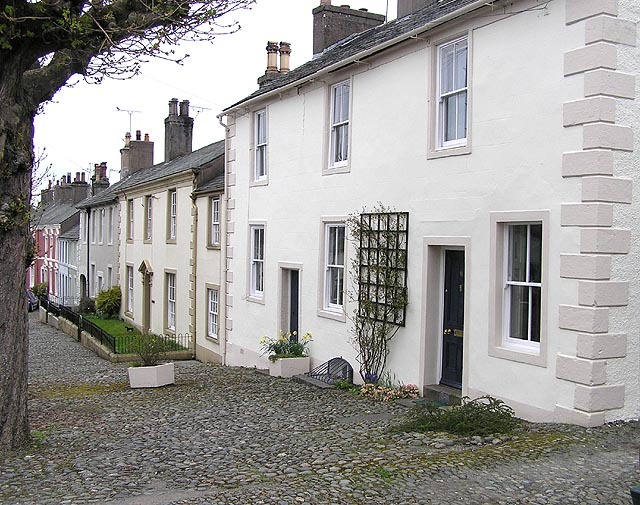 It doesn’t suffer the chronic overcrowding of the more southerly Lakeland towns in the summer time, yet it is only a 10 min drive to Keswick and thence to the northern lakes and hills. Shopping - It is only a 5 min walk to the shops. You can either go across the road and head straight down Cocker Lane to the river with its footbridge into South Street and thence into Station Street, or cross beneath the spreading chestnut tree and follow the path across the churchyard and then down into Market Place. For a city dweller, it is a joy to be able to forget about your car and walk to the shops - and I am the antithesis of a shopaholic! Cockermouth is mercifully free of the chain stores which have proliferated in the high streets of most English towns. Boots is the only one in the town centre, and we now have Sainsburys on the site of the former cattle market. Otherwise, it is local shops, run by local people. The town boasts two ironmongers - an endangered species which has become almost extinct in many other towns and cities. Banks in Market Square is well worth a visit, even if you have to buy something for future use. It is a place where you can buy a couple of screws wrapped up in a bit of brown paper! Something of a time-warp. The other is Firns in Station street. It always has everything that I require in the hardware line. It even smells like a traditional ironmonger’s shop. There is a brilliant delicatessen in Station Street, which also serves coffees and snacks. There are some excellent greengrocers too. Cockermouth boasts five art galleries. Do visit the Percyhouse Gallery and Castlegate House Gallery on Castlegate. Percy House Galleryin Market Place is housed in a sixteenth century house and has a remarkable open fireplace on the upper floor. For everyday shopping, you can probably get just about anything you require in Cockermouth. Pubs Everywhere! - All along Main Street and Market Place, and two in Kirkgate. The local bitter is made by Jennings and it is a ‘real ale’. One of the best bitters that I have tasted. (They organise tours of the brewery. At the bottom of Kirkgate is the Bitter End (named after the Bitter Burn nearby, not the beer), . The Swan across the road is of seventeenth century origins, and is a ‘local’ in the traditional sense, being patronised mainly by regulars. Host is Joe Fagan. Eating out - There are several good restaurants in Main Street and Market Place, and an excellent vegetarian restaurant (Quince & Medlar) on Castlegate. The Bitter End serves pub meals, and if you do not fancy cooking, there are lots of carry-out restaurants in the town. Tourism - The Cockermouth Tourist Information Office is located in the library building on the Main Street, . I try to keep an up to date stock of leaflets in the lounge, so have a look at these. Mostly, people tend to head south into the lakes, but Whitehaven is worth a visit to see the early Georgian architecture. It also has a very good second-hand bookshop! If you are going to Keswick and the lakes, you might like to take the route through the vale of Lorton and then up through the Winlatter Pass. It is a longer journey than by the fast road via Bassenthwaite, but is well worth it, if you are not in a hurry.